I have some really pretty 3D red crystal rhinestones from Born Pretty Store to share with you. They come in 12 different colors, but I picked red because I thought I might be able to make some cute ruby-inspired nail art with them. I thought these would be large, but still small enough to fit one on each finger. The website says they are 1 cm in diameter, so I guess I should have looked at a ruler to see what I was going to be getting. I decided to put the stone on a base of Julep Amelia (why, I have no idea because I hate streaky pearl finishes, but I figured I'd give it a shot since it was in my untrieds). That's a lot of rhinestone sticking out all over the place! If these could be curved, I think they would work a lot better for nail art. They're just a little too chunky and too big for me, though. They are really pretty, just not for nails. They will definitely be going in with my craft supplies for a future project rather than in my nail art supplies box! I have half a billion craft projects in the works so I am sure I'll find some way to use them. If Amelia was a creme, she and I would definitely get along better, because the color is beautiful! If you are perhaps interested in grabbing some of these rhinestones, they are $2.89 USD for 10. 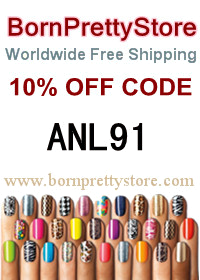 And of course, if you do shop at Born Pretty Store, use my coupon code ANL91 and they will host a giveaway for you here! This product was sent from Born Pretty Store for honest review. All opinions are 100% truthful and my own.